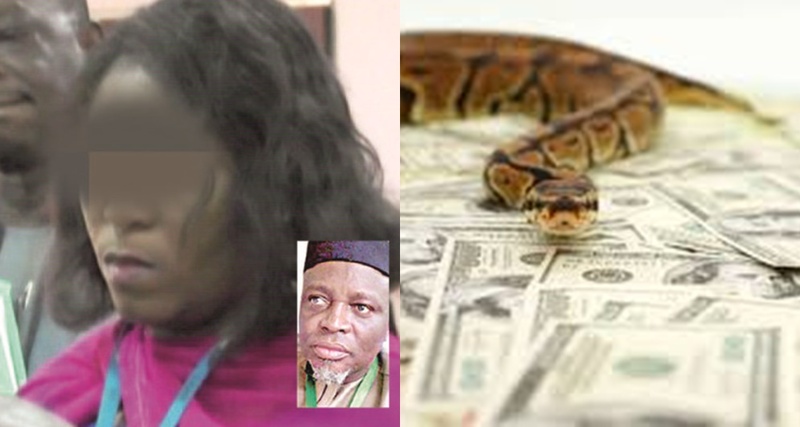 Her madam accused her of turning to a snake and swallowing Jamb's N36m and definitely have to defend herself, hence the 16-year-old girl has opened opened up and what she has revealed is more than a can of worms. Philomena Chieshe, a sales clerk in JAMB office, Makurdi shocked the world weeks ago after she claimed that her housemaid connived with another JAMB staff, Joan Asen, to “spiritually” swallow N36m from the vault in her office. In her confessional statement while being interrogated by a team of auditors, she said that Joan Asen and her accomplices confessed that they have been stealing the money “spiritually” through a mysterious snake that always sneaked into the office to swallow the money from the vault. "It was a mystery to me too. I have been saving the money in the bank, but I found it difficult to account for it. So I started saving it in a vault in the office. But each time I open the vault, I will find nothing. I became worried and surprised how the millions of Naira could be disappearing from the vault. However, when Daily Post reached out to the erstwhile housemaid, who was relieved of her job following the shocking revelation in November 2017, she denied ever confessing to have turned to a snake or swallowing any money in any Jamb office in Benue State. Dor, a native of Angantiv in Obi LGA of Nasarawa State, recalled that her ‘madam’ truly went to Plateau State for a conference last year but she did not follow her. According to her, few days after returning home from the crusade, hosted by a popular man of God in Jos, her boss (Philomena) asked her to go that she was relocating to Abuja. “That was towards the end of 2017. I was at home when they went for the crusade. When madam came back from Jos, she asked me to go that they were relocating to Abuja and she would not go with me. "I came to her house in 2015 July and I did not at any point steal even her one kobo before I left last year. Maybe she was not referring to me, but I am sure she didn’t have any maid before and after me,” Dor, who now resides in Karu area of Nasarawa said when an insider directed us to her new residence. When this reporter stormed Philomena’s family house in High Level, Makurdi on Saturday to confirm if it was Dor, who actually turned to a snake, a man we met there said she had since relocated. " Madam Philo no dey live here again,” he said rudely.